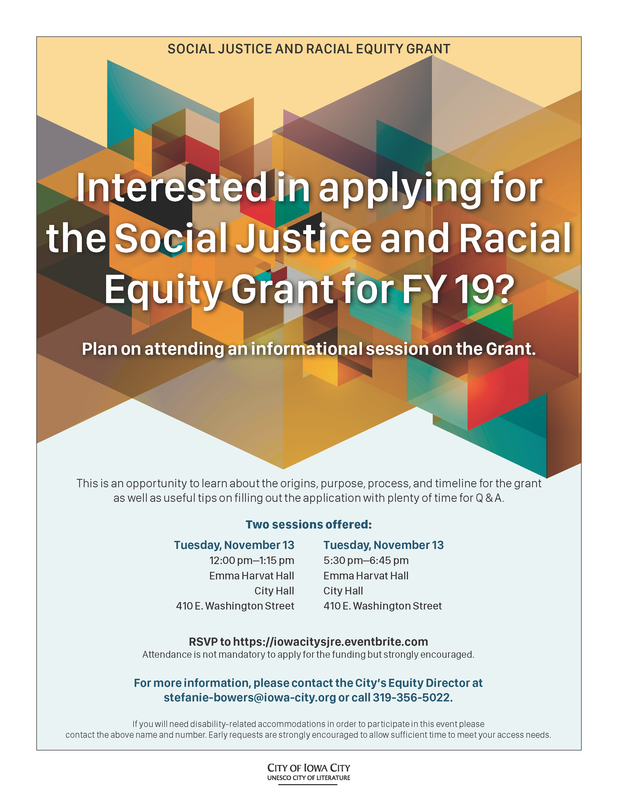 Interested in applying for the Social Justice and Racial Equity Grant for fiscal year 2019? Attend one of two information sessions to learn more about the grant program and how to apply. This event will provide an opportunity to learn about the purpose, process, and timeline for the grant. Participants will also receive useful tips on filling out the application. A question and answer session will follow. Attendance is not required to apply for the grant, but is strongly encouraged. Noon to 1:15 p.m. or 5:30 to 6:45 p.m.
Register to attend one of the sessions at https://iowacitysjre.eventbrite.com.